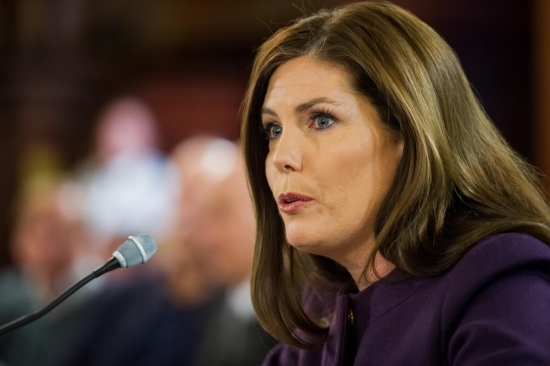 The Pennsylvania Supreme Court unanimously voted on Monday to suspend the law license of Attorney General Kathleen Kane as she fights criminal charges. Kane is accused of leaking grand jury information to a newspaper and lying about it under oath in front of another grand jury. The order for suspension should not be construed as removal from office, but it may prompt efforts to have her removed. The PA constitution requires the top law enforcement officer to be a licensed lawyer. Kane has vowed not to resign and will continue to perform the duties of her office not barred by the order. I am disappointed by the action taken by the Supreme Court today. It is important to note that the order specifically states that “this order should not be construed as removing Respondent from elected office.” I continue to maintain my innocence and plan to keep fighting to clear my name while serving out the rest of my term in office. I am confident the hundreds of employees of the Office of Attorney General will continue protecting the people of Pennsylvania with the same high level of energy, dedication and professionalism they have always displayed. To this end, in the wake of the Commonwealth Court hearing, I’ve instructed my office to engage in a comprehensive review of all emails sitting on OAG servers to fully comply with the RTKLs. Our preliminary review has generated emails of government officials, including law enforcement officials and judges, heretofore unknown to us. These emails will be fully released either as public documents defined by the Commonwealth Court, or at my discretion. Early Sunday morning, a group of University of Delaware roommates caught and held a burglar in their apartment until police responded. It happened around 5:15 a.m. at a home on Kristins Way in Newark. The burglar entered through the front door which was unlocked. One roommate was awoken by the sound of him gathering up items and called for the others. They held the man until police arrived. 25-year-old John M. McCormick of Newport is charged with theft and other offenses. No charges will be filed against a Hatboro councilman who chased after a bank robber and shot him in a parking lot about a quarter mile from the bank. The Montgomery County District Attorney’s office said that there was insufficient evidence to establish elements of a crime or to overcome his claims of self defense. Back on July 8th, Hatboro councilman George Forgeng was outside the TD Bank branch on the 200 block of South York Road when he saw the dye pack explode and began to follow the suspect Kevin Way. Forgeng told Way he had a gun and ordered him to the ground. Way, who is 6' 4” 250 lbs, turned and started walking towards Forgeng. That's when Forgeng shot Way in the arm and hand. District Attorney Risa Ferman said that it is reasonable to conclude that Forgeng feared serious bodily injury and therefore is justified in shooting. It could also be concluded that it wasn't deadly force since he aimed and shot at Way's arm and not his chest. Way is facing bank robbery charges.